The He Ara Heritage Group of the Pukerua Bay Residents Association would like to invite you to the opening of 4 heritage bollards on the Ara Harakeke Way. The event will be on Saturday 19 May 2018 and start at 10.00am by the entrance to Whenua Tapu. That might sound a bit official but it’s really a great chance to see and hear stories about our local history. The bollards have been placed alongside the walkway to mark significant events or places at those sites. It’s a 2.5 km walk down to the Z Truck Stop and Mayor Mike Tana is officiating at all four of them. He will be ably assisted at each one by our selected historians who will give a potted history of the significance of each site. A representative from the Hongoeka Marae will bless each one and Mayor Mike will unveil them with a flourish. As a bonus, Mike Jebson from the QE2 National Trust and a resident botanist will speak as we pass the Taupō Swamp sign which was recently rediscovered. The last time it was seen out in the open was when the Queen was here! At the Truck Stop we will have available some ‘local’ refreshments. They will be non-alcoholic and child friendly. Actually they will be real fruit ice blocks made on the Kāpiti Coast by a couple of ladies just starting their business called Paekākāriki Pops. It was almost a day for hats and umbrellas last Saturday, but the rain was kind and merely washed the station so Ngāti Toa Kaumata Taku Parai could bless the new Pukerua Bay station building and the He Ara Pukerua heritage sign. Greater Wellington Regional Councillors Jenny Brash and Barbara Donaldson cut ribbons to formally open the station, and Porirua Mayor Mike Tana unveiled the He Ara Pukerua sign, which is the first to mark a Pukerua Bay heritage site. 27 May 2017 will also be remembered as the day well-known Pukerua Bay resident Ray Brown sang his song “Pukerua Bay” which he composed in 1958. He Ara Pukerua is the name of the Pukerua heritage project, and recognizes the many tracks which are part of Pukerua Bay’s history. 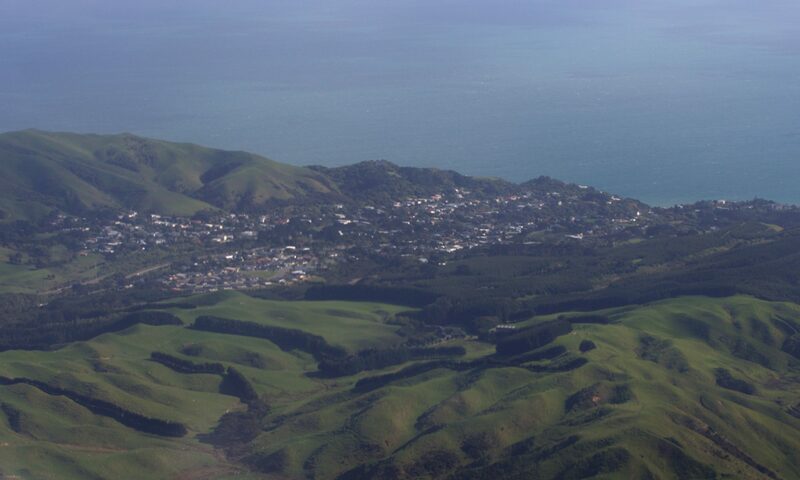 There are many other places of interest in the history of Pukerua Bay and the Heritage Group is seeking contributions or memorabilia towards recording them. Photography © 2017 Ivor Earp-Jones.